As a rule, I generally try and ban electronic devices from holidays and days out. H, H and J know that they can play on their tablets and computers as much as they like when they are at home but when we're out and about, their devices usually stay at home and they can entertain themselves in other ways. Harry (10) and Heidi (8) are old enough now to read longer books and they can happily sit in the back of the cars for hours reading. We always buy/borrow new books over summer whether this be with a trip to the library, charity shop or WH Smith at the airport. 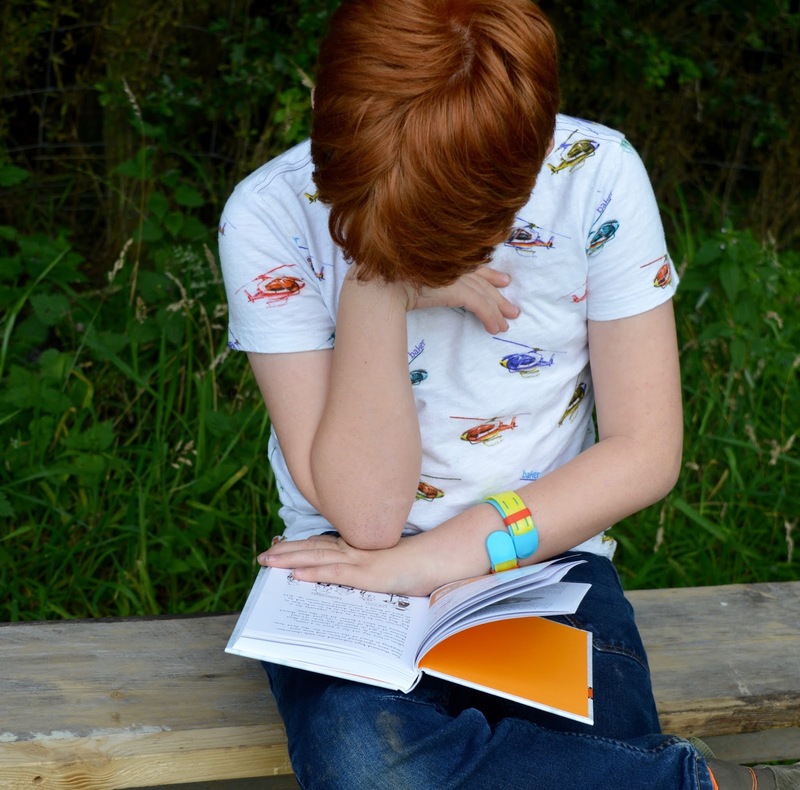 I really believe that summer is a fantastic opportunity for kids to lose themselves in a story and I'm delighted to be teaming up with Puffin and their 'Start A Story' campaign this summer. 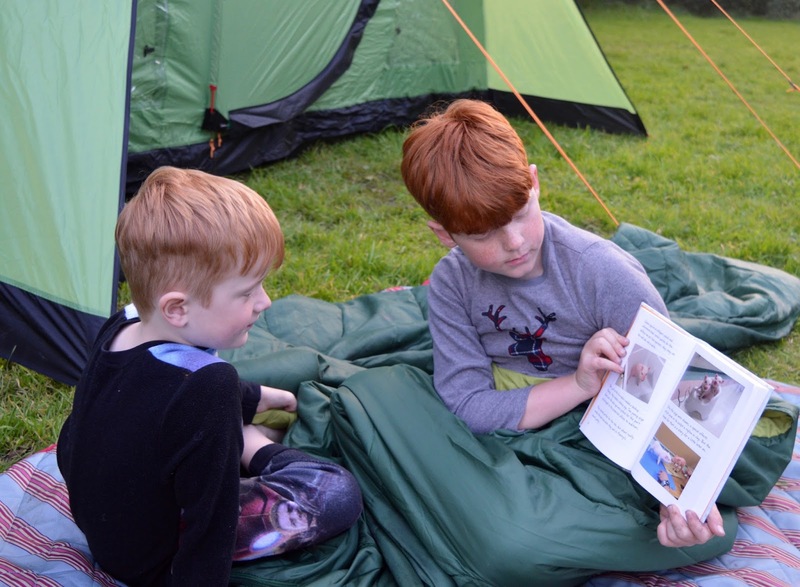 Harry, Heidi and Jack read for every evening in bed for 30 minutes before they go to sleep during term time. I must admit I am more relaxed about this in the holidays but that doesn't mean the kids don't enjoy lots of reading time. 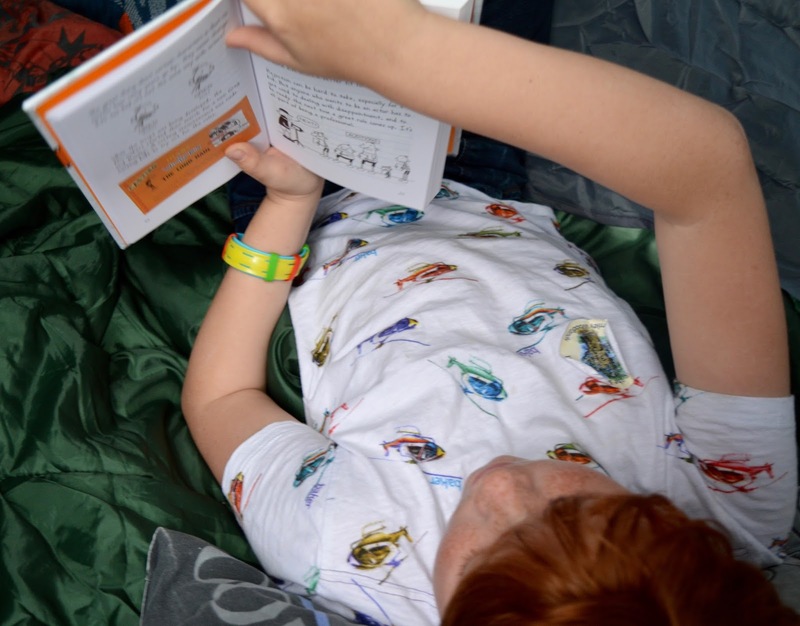 Books will always come on holiday with us and during our trip to Wales last month, Heidi and Harry both read 3 big books from cover to cover and Jack read the same book over and over every night (he's a creature of habit). 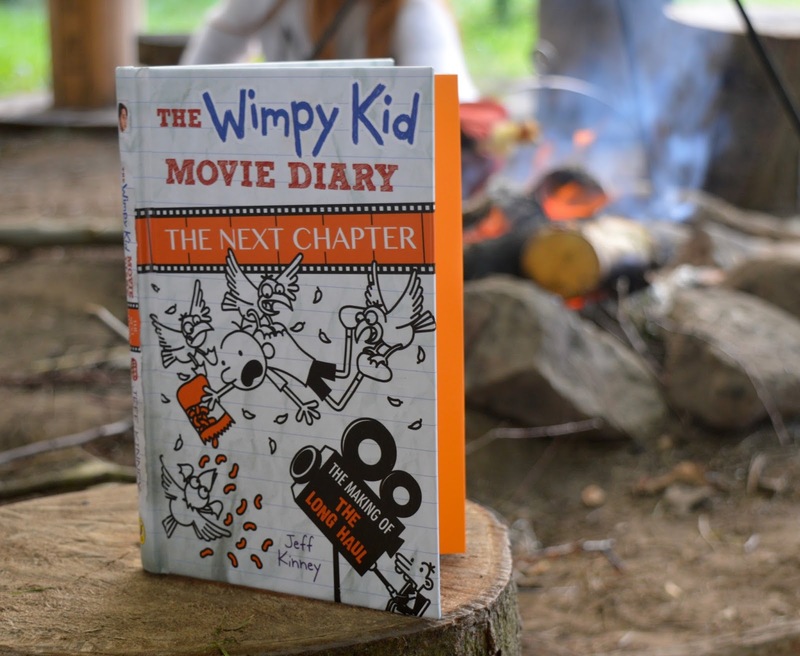 Puffin sent the children some new books to take camping with them this week (you can win these books in our giveaway if you scroll to the bottom of this post) and I was amazed that Harry read Diary of a Wimpy Kid from cover to cover in one night. 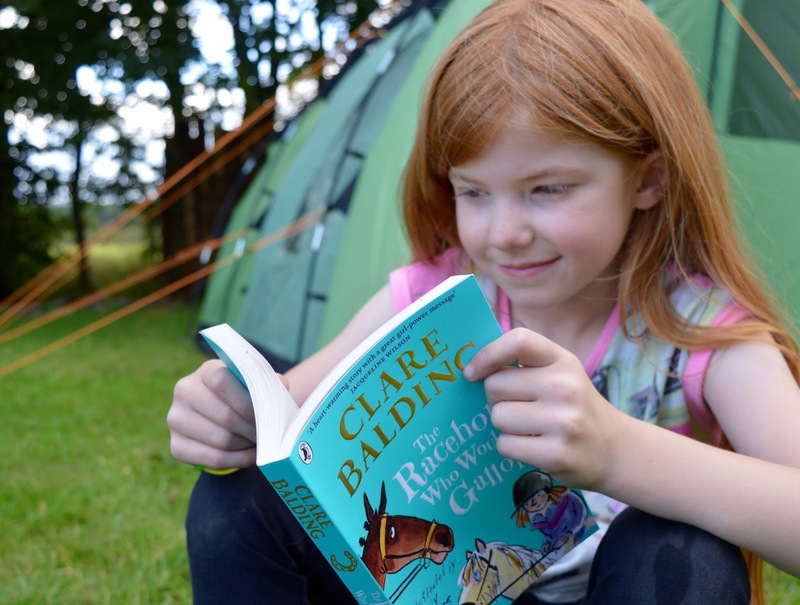 Take books and torches with you during camping trips and encourage reading by torchlight - it's super exciting! Create a summer reading corner in their bedroom with cushions, a stocked bookcase or book box and a water bottle - somewhere they can head to relax or if they need some time away from the X Box. Check out these reading nooks if you need any inspiration. We love the classic 'Where's Spot' which we have passed to my 2 year old nephew to enjoy. This is a story I remember as a child myself and a real favourite with my own children when they were younger. If you don't have it in your collection, I can highly recommend buying the board book and it will be a story that is shared time and time again. 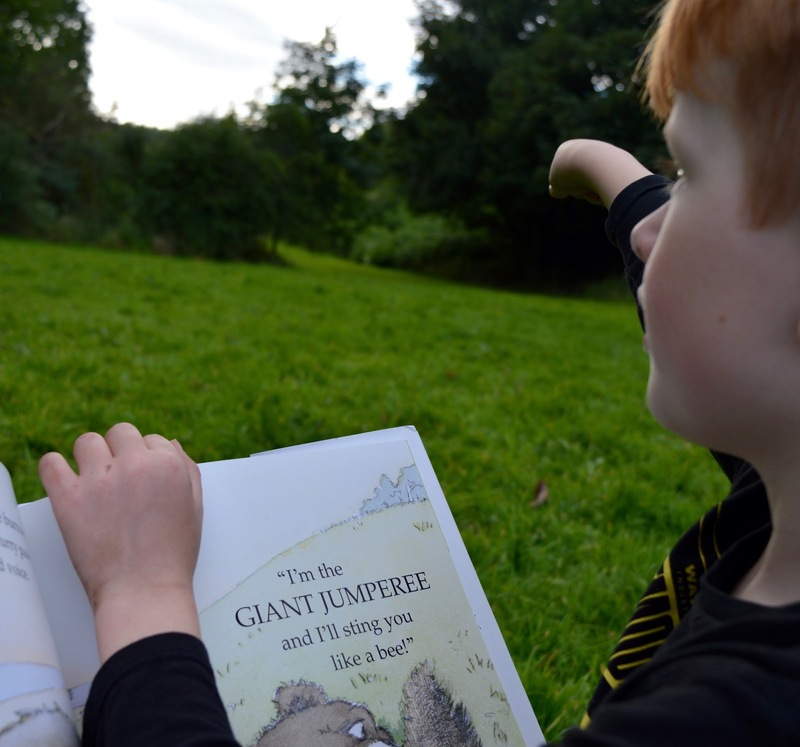 Our second recommended book for this age group is 'The Giant Jumparee' which is by one of our all time favourite authors Julia Donaldson. 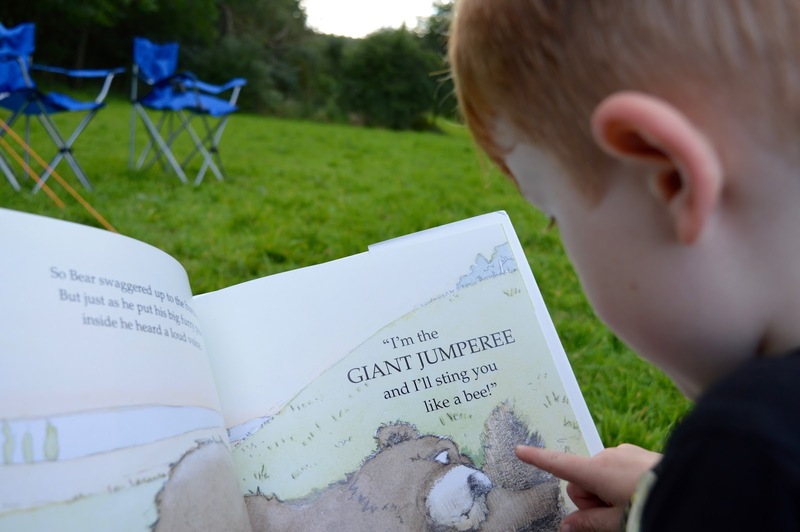 Although this is aimed at children aged 0-5, we are all Julia Donaldson fans and had not read this story so decided to take it camping with us anyway as a good bedtime story. The plot is simple with rhyming words and I imagine it will definitely keep the attention of very small children as they follow the tale. What I like about this book is that Jack (aged 6) could easily read it himself but we could also enjoy it as a family when I read it to us all (complete with silly voices) in the evening before bed. Heidi (8) is only just starting to read bigger books - we used to laugh as she used to 'pretend' to read them but now I can see she is definitely reading and taking everything in. 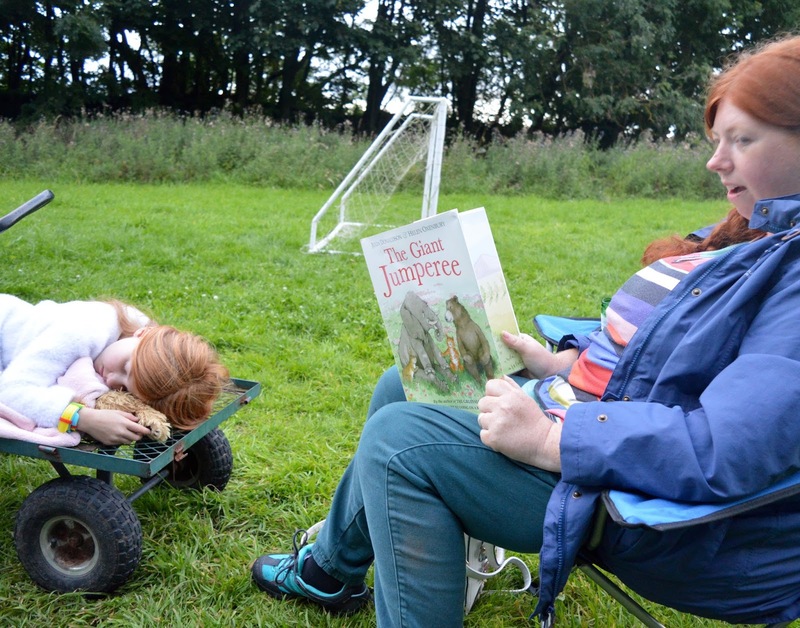 She loves reading in the car during road trips and decided to start reading 'The Racehorse Who Won't Gallop' during our camping trip. This is quite a big book so feels quite grown up but Heidi has been enjoying it so far. Another book recommended for this age group is 'George's Marvellous Medicine' by Roald Dahl. Harry picked this up to read in the car on the way home as he had finished the book he'd brought and this was going spare. Harry is probably the only child I know who says they don't like Roald Dahl books but this book kept him quiet for a whole hour as we packed up the car after our camping trip and travelled home so I think that the time is perhaps turning! The second book recommended for this age group is 'Wave Me Goodbye' by Jacqueline Wilson. This book tells the tale of a 10-year-old girl who is sent away on a train with her schoolmates during WWII. This is a big book and could probably last a full week's holiday if read regularly. Harry is going to try this book once he's finished George's Marvellous Medicine. I'll Tweet how he finds it. I honestly can't imagine going on holiday or taking a day trip without a book in tow - both for myself and the children. Summer is a time where life slows down for us a little and it's lovely to have a full six weeks to lose yourself in multiple books. 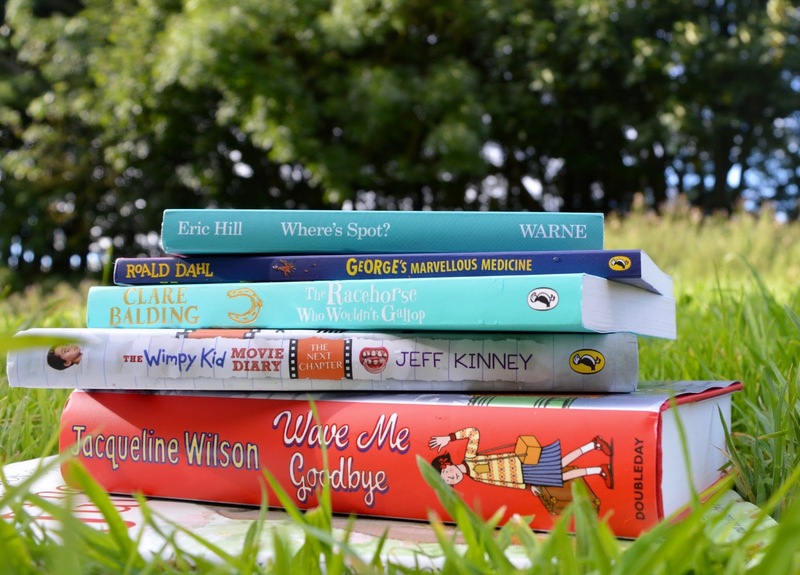 We have a few other trips planned this summer and once we've finished these books we'll definitely head to the Puffin website and select a few other books from their range. Puffin books are so well known and you know you're buying a quality book if you spot a little Puffin on the cover. Please enter via Rafflecopter below (ends midnight 20th August 2017). Good luck! Great prize :) thanks for the chance. Good luck to all. The Mr Men books because I remember reading them as a child and enjoying them. A Summer Double Daisy by Kes Gray & Nick Sharratt just like my little one always up to mischief! The Racehorse Who Wouldn't Gallop (Charlie Bass) It has a strong girl power message and of course horses! Which my daughter is mad about! I would choose The Jolly Postman by Janet & Allan Ahlberg, I read this to both my children, it was one of their favourites, and I know my granddaughter would love it, especially reading the letters. I loved reading as a child and it's so lovely to see your children with a book using their imagination. Love from Lexie interests me. Cathy Cassidy is a big hit with us and I haven't seen this one before. Thanks for the great giveaway. I love the idea about reading with a flashlight! There's a Monster in your book - my little boy is really into monsters, so he'd really enjoy this. The Jolly Postman by Janet & Allan Ahlberg.....I adore this book so it was one of my first picks when my little girl was born. There’s a Monster In Your Book by Tom Fletcher & Greg Abbot. This sounds a busy book to keep my grandchildren amused and laughing not for bedtime though. The 'Where's Spot?' book, brings back great memories! 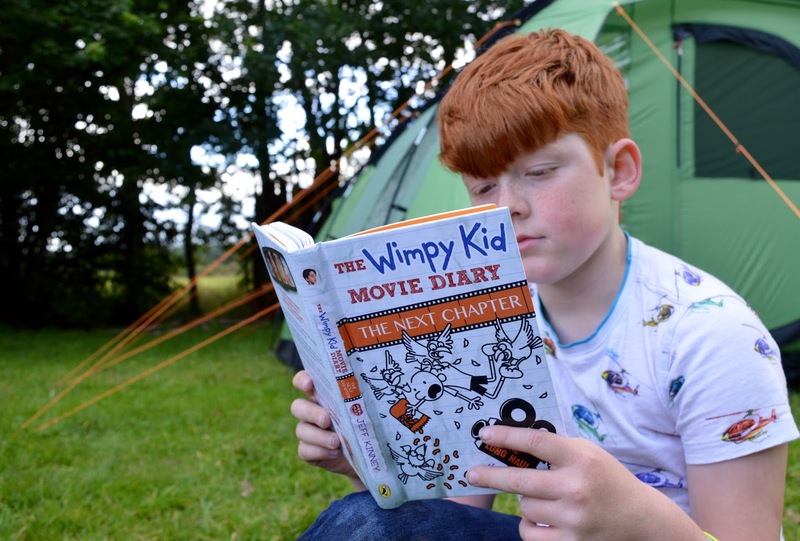 The diary of a wimpy kid books look amazing! Diary of a Wimpy Kid books are so funny and its great that the author is continuing yo bring out new stories which my son loves to read. The Diary of Dennis the Menace: Rollercoaster Riot! The trials of APOLLO looks like a good book. The Jolly Postman by Janet & Allan Ahlberg has really good reviews but somehow I have missed reading it to the children. The title sounds rather good too. Hairy Maclary because i know my son would love this! Tilly and the Time Machine looks funny & exciting! Has to be the giant jumperee as i want to read the book as it looks interesting by the cover of it. The Racehorse who Disappeared by Clare Balding because Clare knows all about racehorses and is bound to have made this a really good read! The book that most catches my eye is 'There's a monster in your book' by Tom Fletcher. It seems like such a fun story! Definitely Meg and Mog. I am certain I read it as a child, but I can't actually remember it. George's Marvellous Medicine as it was part of my childhood and my niece would enjoy it. The Dark Prophecy looks great, my son's kind of book. The Milly Molly Mandy stories! The toddler books as my little one likes simple stories - eg Funnybones! Fungus the Bogeyman - sounds funny! The Racehorse Who Wouldn’t Gallop by Clare Balding & Tony Ross - because I always got lost in horse stories at that age. I think that my son would like Hilo The Great Big Boom Hilo Book 3 by Judd Winick. They all look like stories my girls would love, but I'm going to have to with Fungus the bogeyman. top bloke! I'm intrigued by the Doctor Who books - had no idea they existed! Great for both kids and adults alike. I would love Little Women for my daughter. She is an avid reader and I can remember loving this book at her age. Alice's Adventures in Wonderland: V&A Collector's Edition! As i love the original book and this cover is beautifully illustrated! George's Marvellous Medicine - a classic which I loved as a child and I know my children would too! I like the look of The Trials Of Apollo, as my boys love an adventure story! George's marvellous medicine , I remember reading this when I was young and laughing lots so I know my 5 year old son would love it too.